​Crank your driving skills up to the next level with the Hot Wheels® Ai Straight Track Pack and the Curve Track Pack. 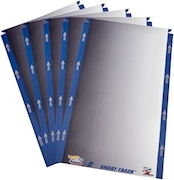 Each pack has 5 additional SMART TRACK™ pieces to extend sections of your track layout so you can really pour on the power. It's easy to put together your SMART TRACK™ using the Hot Wheels® Ai quick tab-in system. Make more track layouts than ever!